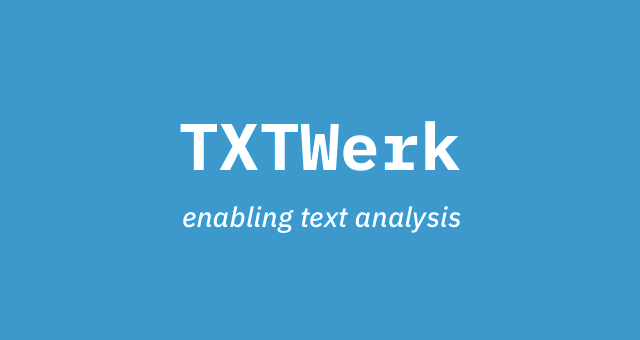 TXT Werk is a lightweight text analytics JSON REST API. We are specialized in analyzing German and English texts. Using TXT Werk, you can easily get information from any of your unstructured text data. Employing complex linguistic and statistical algorithms, TXT Werk is able to read and understand your text, at massive rates of speed. So whether you have 1,000 documents or 10 billion, TXT Werk quickly digests all of these data and extracts knowledge that is critical to your business: Find keywords in your text, link named entities (persons, organizations, locations) to Wikidata URIs, discover dates and normalize them! TXT Werk even recognizes unknown person names (open domain entity recognition) in the text. If you need help using the TXT Werk API, please read the documentation.